How much does a wicket mean in T20 cricket? Is the main job of a bowler to take wickets or contain runs? Which is better off 4 overs, 4/40 or 0/16? They are all interesting questions. In a large degree limited overs is much more interesting statistically than test cricket. Because there are finite resources, and more than one of them, the analysis can be quite different to what is required in the full game. The concept of batting and bowling averages are easy to calculate and are effective for telling us who is the best performers in the longer form. But someone that averages 18 and goes for 12 an over in T20 is not really as useful as someone who averages 24 and goes for 6 an over. So I tried to see if I could quantify the value of a wicket in this years IPL. To do this I looked at every innings total. I found the run-rate (using 20 overs for any team that was bowled out) for them, and then put them into a graph, to see if anything interesting came out. In the process I noticed something: in almost every game the team that lost the least wickets won. In the 42 games where the teams lost a different number of wickets, the team that lost the least won on 33 occasions. That's 78%. To put that in perspective, when teams score 180 they only win 69% of the time. So losing less wickets is a better predictor of winning than scoring 180. This was a surprise to me. While it is obvious that wickets lost are not the only factor that determine the scoring rate, it is also clear that there is a relationship between the wickets lost and the run-rate. I had previously been a fan of Glenn Turner's theory of "You're all out after [20 overs] so you shouldn't leave any wickets out there" over Richie Benaud's theory of "It's a cardinal sin to get bowled out before your overs are up." However, it looks like Richie has actually got the better theory. It is clear that (generally) if a team loses more wickets, they end up scoring at a slower rate. Now clearly the timing of when the wickets fall is important, but this graph suggests that it's not as important as we would have thought. The other interesting thing here is that this gives us a value for a wicket. 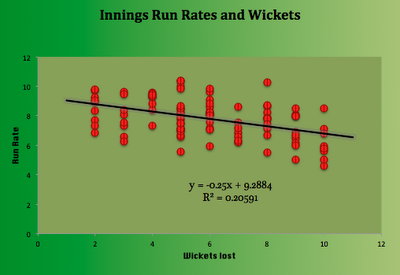 Every wicket, on average, results in a team scoring 0.25 less runs per over in their innings. Hence every wicket is worth (a surprisingly low) 5 runs. 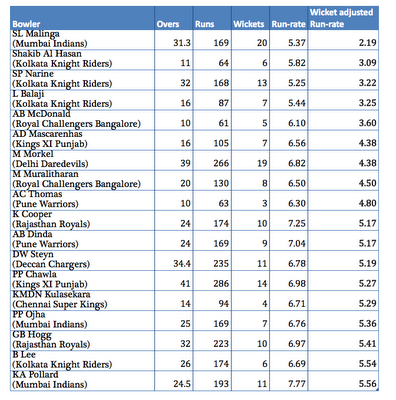 This allows us then to compare some of the bowlers, and see who has actually been the most effective in the IPL. If we consider that every wicket is worth 5 runs, we can subtract 5 from the runs a bowler has conceded for every wicket that they have taken, and then we have a fair way to compare them, by looking at their economy rates. At the top, as we expect is the magnificent Lasith Malinga, who has proved his doubters that he more than a one-trick pony. But the real interest for me comes form the next 3 names. All of them are KKR players. When we combine them with Brett Lee who is further down the table, it isn't difficult to see why they have been the hardest team to score against throughout the tournament. I'm glad someone decided to look at the correlation between wickets and wins because I did it the first four seasons & there was a very strong one between winning and losing less wickets than the opposition. What is interesting, though, is the correlation isn't as strong this year as it was in the previous editions. The team losing more wickets has won 9 games this season, while it happened only 4 and 7 times in 2011 and 2010 respectively. I've lost the spreadsheet in which I'd saved these stats, but I think it was something like teams losing less wickets than the opposition ended up on the losing side about 10% of the time. 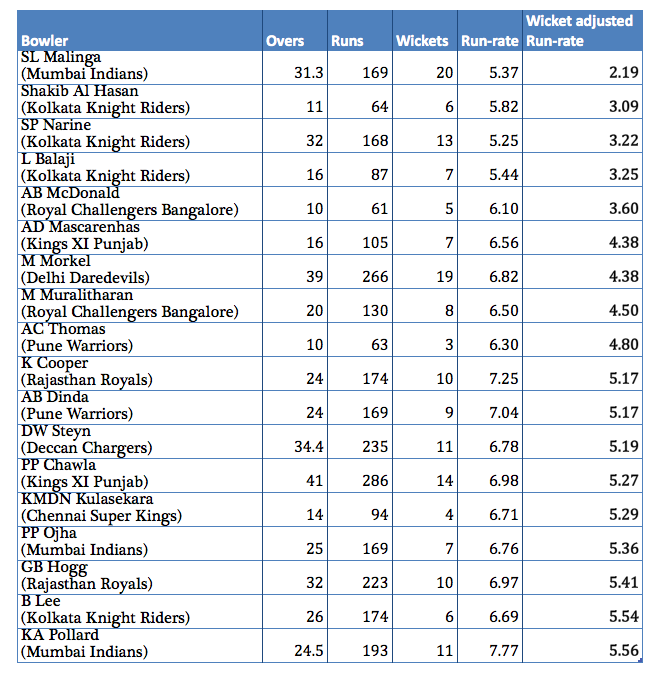 The presence of KKR bowlers near the top of the list is down to the pitch at the Eden Gardens. It's the least batsman-friendly pitch this year & more often than not favours slow bowlers. Hmm. I'm all for recognising that wickets have a value, but the timing does matter more htan you suggest. Early wickets should result in lower overall run rates and low early run rates will make late wickets more likely. The correlation is strengthened by both of these effects, and so it doesn't really tell us how important a wicket is. But say the correlation is enough, or that we can put a value on a wicket some other way. Then the first thing I think looking at the adjusted run-rate is double counting. Some of the effect of the wickets will be seen in the bowlers' figures already, before subtracting. Same goes for bowlers with wicket-taking teammates. Perhaps a more meaningful use of a wicket value would involve adding the saved runs on first, but that involves counting wickets in each match as well as players' aggregates. Mykul, interesting stuff. David Barry did some preliminary work on this a few years ago. The numbers he came up with were a little smaller, and dependent on when the wicket was taken. 1) In the first innings teams have a fairly standard distribution of wickets centred around 7, and are slightly more likely to lose for each wicket lost. That is to be expected; teams often have similar scores around the 10 over mark (worth a post on its own, but I lack IPL data). After that, batsmen take risks, if they succeed the run-rate accelerates, if they lose wickets they stagnate. 2) In the second innings, teams have a flat distribution of wickets lost, and an almost binary change from winning 90+% at 4 wickets to losing 90+% at 8 wickets. This also makes sense, batsmen take risks in proportion to runs required. To win, a bowling team needs to dismiss the risk-taker, and get a batsman to the crease who can't score quickly when taking risks. What I've not been able to determine, is whether a bowling team should actively seek wickets, on the basis that they need them to win; or whether the wickets lost are always an artifact of the equation brought on by defensive fielding. I'd like to think the former, because it would make captains attack. Certainly teams bowling to batsmen needing relatively few runs, have nothing to gain by defensive fields. I think that this question "how much should we attack" is the thing that (for me) makes limited overs cricket the most watchable. I really don't get excited by 4's and 6's as much as I get excited by batsmen and captains having a battle of wits. The ebbs and flows are not as dramatic in a short game, as they don't have the build up time, but I think that they make up for that by happening much more regularly. I've decided over the last year or so that I really like t20 cricket, and mostly because of these sort of decisions that teams need to make. Another cracking piece of analysis. All the better for its simplicity and great graph. Here's a few complicating thoughts that your clever analysis prompted: the wicket-adjusted run-rate feels as though there is an element of double-counting. If losing a wicket costs the batting side 5 runs, then that should already be evident in the bowler's analysis. Should it be taken out again in the adjusted run rate calc? So, could 1-20 be consided equivalent to 0-25, rather than 0-15? I.e. Bowler A's spell would have cost 25 runs, but full toll wasn't taken because a wicket fell to him (odd logic, but recognises that many wkts in T20 are batsmen error?). The 'real' situation must be more complex. Perhaps something like: Bowler A, by taking 1 wkt, has depressed the scoring rate of those who bowl after that wkt fell (including himself). Hope those thoughts are useful. Final note: in the 20 overs cricket I play (duration of match being the only think in common with IPL), my team won a game last year without taking a wicket. We were assisted by the league rule that players scoring 30 retire. The opponents scored 100-0 (2 retirements), which we chased successfully for the loss of 6 or so wkts. You make a good point. Perhaps it would have been more fair to have only reduced the runs by 4 per wicket, as 1 of those runs would have come off the bowler who was bowling. However I think if we look at overall contribution, that is a fairer way. Each wicket costs a team 5 runs, and that may or may not be subtracted from the bowler who took them. For example Gavin Larsen's economy rate was lower in matches where Danny Morrison played than in matches when he didn't. Often Morrison would get out batsmen and the new men would play cautiously against Larsen as a result. There are no doubt plenty of factors that make a big difference, and the R^2 value suggests that wickets only account for about 20% of the variability in the scores. However I was surprised that it was that high, and I found that to be very interesting. Great topic to start a discussion on. a) How did you account for run outs? b) Can you sort the dismissals in to fielder-dependent (caught/run out/stumped etc.) and fielder independent (bowled/lbw)? c) In the games that teams that lost fewer wickets ended up losing, were they biased towards teams that batted first? a. I didn't account for run outs except that they were wickets and so were part of the innings wickets. I also couldn't account for the success of other bowlers in the team. Obviously if someone is bowling after a bowler who has just taken 4/13, the batsmen are likely to be a bit more cautious. b. I probably could, but it would take a long time, and I'm not sure what it would achieve. I feel that it can take equal skill to trap a batsman into playing a false shot and getting caught on the boundary as it does to get him to miss a straight one and get out lbw. Often getting someone out bowled is a batsman's error, while caught is a case of the batsman was genuinely beaten by a good delivery. c. they didn't seem to form any particular pattern. 5 of the time it was the team batting first that lost the most wickets and still won, the other 4 it was the team batting second. The possibilities of get a hang of the pitch is more when you dont lose wickets. And the problem here is a binary outcome. Teams that end up losing just 2 or 3 wickets mostly do so with a good score. And teams that struggle do so because they lose wickets or that may be the cause. It will be interesting if you tabulated the number of times a team has lost just 1 or 2 wickets, scored not more than 145-150 on a batting wicket and managed to wind. Or else this becomes yet another feather to the hat of quantitative fluff. There have only been two games like this, and both went to the bowling side in the final over. Likewise there have only been two where the team batting first has scored over 170 and lost more than 7 wickets. In both of those the runs were scored in the final over also. I think that there is some value to it, however, as we can measure some of the value of a wicket. There is clearly more than one factor that determine the score that a team gets, the nature of the pitch, the quality of the bowlers and batsmen, the field settings, the atmospheric conditions etc. However this does not mean that we can not find a significant quantitative value for a wicket. Once we average it over a sufficient number of innings (96 here) we can start to get a realistic picture as to the effect.